Recorded on January 8, 2012. 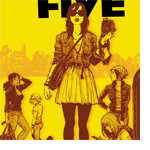 This week we review Brian Wood and Ryan Kelly’s Vertigo mini-series The New York Five. This allows us to reminisce over their previous work together and to discuss the nature of New York City and what it means to us… which is not much at all. We also talk about facing our demons and finally going to a movie theater again after a string of terrible movie-going experiences. Finally, we begin The Worst Contest Ever! Details in the listening!